World Famous Aluminet "Cool Shade" is a highly reflective Aluminized Knitted Shade Fabric that provides significantly cooler shade by reducing heat build-up inside your marquee/gazebo, crate, patio or anywhere you require ventilated shade. 70% shade factor controls more air circulation and provides uniform shade. 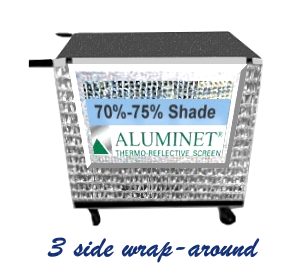 Your Aluminet will look as good as new!